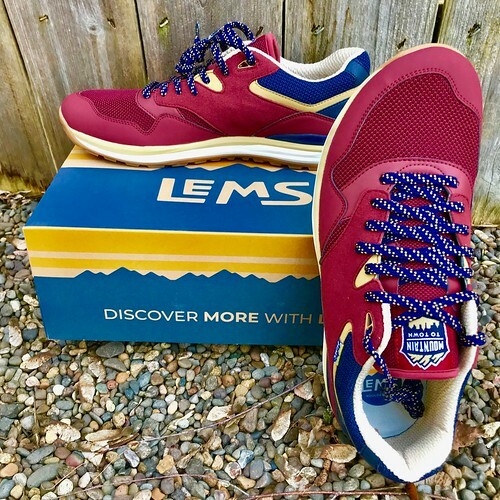 Though we have been aware of Lems for a half a decade or so now, in the past year or so they have gone under a little bit of a redesign – some in their new logo style (a big upgrade, I will say), but also by adding a Mountain-to-Town series, which features a slimmer toe box than the Origins line. One of their newest shoes in this Mountain-to-Town series is their Mountain Trailhead shoe . First things first, these shoes look awesome. It’s like running sneakers from the 90’s and technology from 2018 got together and had a shoe baby. There are three color styles (the other two being primarily brown or green), and they just look sharp – almost too good to sully on the dirty trails! Functionally, these are still a relatively minimalist hiking option, but sacrifice some of the ultra-flexibility that Lems is known for. It’s still pretty lightweight (11.7 oz in a mens size 10), but the insertion of a rock plate to hold up to the wear and tear of hiking, there is naturally some sacrifice. The rubber outsole and tread are durable enough for trails, but don’t look weird (i.e. stupid) when wearing them out and about in public on a daily basis. The one drawback (as seen from their review page as well), is that fact that these stray a little bit away from the “historical” Lems. We have been reviewing footwear from them since 2015, as well as a few times over the past few years, and the defining features were the zero-drop and the ultra roomy toe box. I will say though, that they are not attempting to be sneaky about these changes in this style – there is clear information on both their website and in videos (see below) that highlight this change. Though I was responsible for a few of our Lems reviews, I never really fit the mold of someone who “needed” those features in their footwear. I have a relatively “normal” foot shape – nothing too thin, but definitely not in need of more room – and zero-drop was fine, but also not a necessity. So, with the Trailheads, I actually really enjoyed them even more since they aren’t so roomy. I am guessing that this may be their thinking behind it (making a shoe that isn’t as limiting and can draw new people in), but if those specific features are a need for you, they may or may not be your best fit. I have really loved these shoes. They look much more streamlined then Lems I have worn in the past, and their design gets compliments pretty much every time I wear them in public. I anticipate wearing these on some trails this year, but they are fitting in quite nicely as a comfortable everyday shoe regardless. Mountain to Town indeed! Thank you to Lems for providing us with a sample pair. Please read our transparency page for info on how we do our reviews.